Chinese New Year is coming in a week! Most Chinese families will cook up a storm for this great season. Chinese people also have a tradition of visiting their relatives and friends during Chinese New Year. It’s called 拜年 (bai nian), literally means visitations in new year. My parents liked to bring some butter cookies when doing visitations. 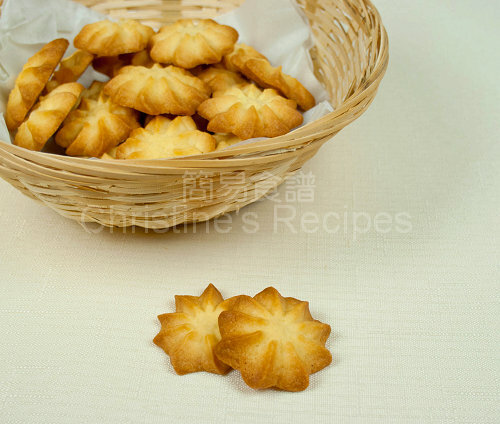 In Hong Kong, butter cookies are one of the popular snacks in this festive time. These cookies are very crispy and buttery with beautiful patterns. 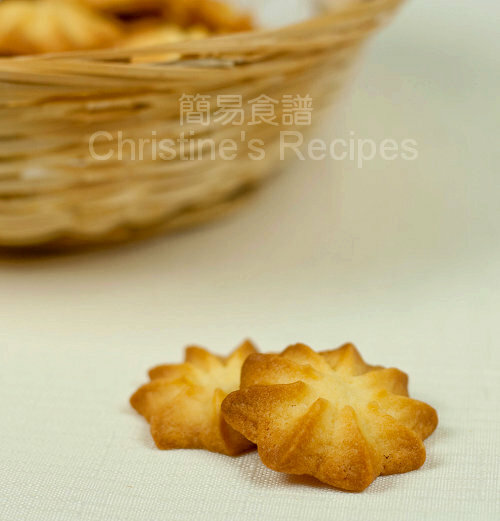 When it comes to baking butter cookies, we might experience that it’s not easy to keep the good-looking pattern of cookies because the batter would flatten wide after heating up in oven. Well, there’s a secret behind, I share later on, for baking cookies with your preferred brilliant patterns. Cut butter into cubes and allow to soften at room temperature. If time is limited, here is a quickest way to soften butter. Melt butter in microwave at high-medium power for 10 seconds or so, then transfer to freezer for a few minutes. When the butter begins to be frozen again and thickens, it’s ready to use. If not, put it back to freezer for more minutes. 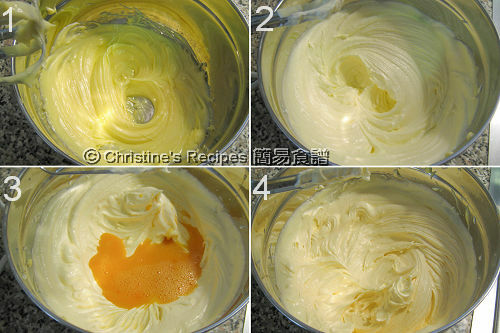 Cream butter with an electric mixer over medium speed until smooth (picture 1). Add caster sugar and icing sugar, continue to cream until fluffy (picture 2). Add one-third of the whisked egg into the butter mixture at a time (picture 3). Stir and combine well between adding egg each time, the volume increases and colour lightens (picture 4). Stir in vanilla essence and combine well. Sift flour into the egg mixture (picture 5). Use a spatula to combine all ingredients (picture 6). Don’t over stir, just incorporate the flour into the mixture. Transfer the batter into an icing bag (picture 7). Pipe the batter on a lined baking tray with baking paper, in 1.5-inch (3.8 cm) circles, that’s about 1 tablespoon each of batter, evenly spaced 1.5-inch apart (picture 8). Bake in the preheated oven for 10 to 13 minutes, or until golden brown. Let cool on a wire rack completely. Store in an air-tight container. The baking time of cookies is quite short at high temperature. Don’t leave them unattended, especially for the last few minutes because you don’t want them burnt. When the colour turns to the point a bit lighter than you prefer, then you can remove the cookies from oven. The cookies will get a bit darker after a while. Well, practice makes things perfect. After some trials, you’ll bake cookies with perfect colour to your liking. How cute and skilful. can you send some over here please? oh I must try these, they look fabulous! A hearty gift for the CNY for sure, and look so crisp and neat are they! Should read...stunning butter cookies of V's day! So pretty, they look perfectly delicious! These are so pretty! You can tell how buttery and tender they are just from the photo. Yum and so lovely and festive - your cookies would be the perfect addition to any celebratory platter - I saw so many folks carrying flowers and flowering branches this weekend - CYN is here. Its such a special time, I cannot wait until the parade. What beats a classic cookie anytime? Christine, I have a question. The icing sugar you mentioned here is different from the power sugar, right? I couldn't seems to find the icing sugar in the stores! Help! The icing sugar I used was like this one, but different brand. Can you ask any staff to locate for you at nearby stores? Is Cake flour same as normal corn flour/ plain flour? Gong Hei Fat Choi. Si Si Yu Yee. Cake flour has the lowest percentage of protein than plain flour, below 8.5%, although both of them are made from wheat. Corn flour is made from corn. For more details, you can google them. Does the recipe call for melted butter or room temperature butter? what size star shape piping tip did you use? How many cookies does this recipe yield? It calls for softened butter at room temperature. Actually, I did it in a quick way: first melted in a microwave at high power for 1 minute, then chilled it in freezer for a couple of minutes into a soft and thickened mixture. Then I creamed the sugar in as the picture1 shown above. The piping tip I used is 1cm wide in diameter. if i replace some of the flour with cornflour, will that give the texture of 'melt in the mouth'? and can you suggest recipes on chewy chocolate nut cookies?? if i replace some of the flour with cornflour,will that give a 'melt in the mouth' texture? if yes,how to adjust the proportions? and do you have any chewy chocolate chip nutty cookie recipes to suggest? If I don't want to use a piping bag, can I just bake them using teaspoons to measure the amount? Sure, you can use teaspoons instead of piping bag. Drop the batter on the baking paper and spread it evenly. I'm in UK and I can't find cake flour in the normal supermarket. any alternative flour I can use? You can use 2 cups of all-purpose flour, then take out 4 tablespoons of it, replace with 4 tablespoons of cornflour. You have to sift the mixture through a fine sieve for several times to get them mixed thoroughly. Lastly, measure out 200 grams of them for this recipe. Thanks for replying my request so quickly. I'm glad I can use alternative flour instead of cake flour for this recipes. One more question please if you don't mind. I have see a couple of your recipes that also using cake flour, and I want to try them on too. So i wonder can I use the same guidlines of amount of all-purpose flour and cornflour that you mentioned early on and replace the same amount of the cake flour according to different recipes? Many thanks for your help in advance! When you say vanilla essence, are you talking about vanilla extract? Yes, you're right. It's also called vanilla extract. Thank you for the recipe. My batch turned out great. Light and crunchy. (: Just a tad bit dry though, I'd add a bit more butter next time. Overall, great recipe. Not to bake over time or over heated, then the cookies won't be too dry then. The main cause could be the butter was not beaten enough, or melted. The process of creaming butter with sugar is to incorporate air into the mixture, that makes the cookies crunchy. How did your butter look like after you beat the butter with sugar? Was it fluffy enough? Hi, may i ask how many cookies does it make using the above amount of ingredients? Made about 36 cookies. Depends on how thick and big your cookies are. Sorry, haven't tested this recipe with only egg yolk. 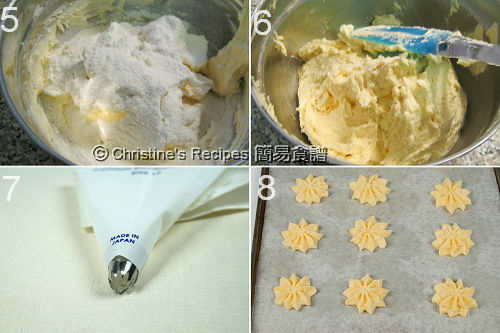 HI Christine, can I use a cookie cutter to shape these cookies instead of pipping bag? You might use a cookie cutter, but you need to chill the batter well before working with it. I'd suggest you try another brand first because the texture won't be the same if you add more butter. Hi, will there be any difference in taste between the unsalted butter and salted butter? There's no difference in taste between unsalted and regular butter. If using unsalted butter, you can have full control of the amount of salt used in baking/cooking. Thx for sharing baking tips, successful recipe & your joy! I'm a new starter in baking. Tried the banana cookies (thick) & my husband likes it! Now want to try this recipe, can I use brown sugar or 片糖 to replace caster sugar (I need to avoid white sugar)? If yes, same portion? Thx for your help! 片糖 doesn't work for this recipe. You need very fine sugar to beat with the butter. My cookies didn't stay in the shape I pipped them in. How can they turn out in the star shape? Could it be your batter getting melted? You can chill it for a while in fridge, then pipe it again and see if the shape stays. My batter was ok, it piped out fine. Into a star shape, however when it baked, and it came out of the oven in a circular shape? Thanks for the reply, the batter wasnt melted. It was in a nice star shape when it was piped out? Also, where can we buy cakr flour in Australia? Can we use bread flour instead? Did you use the right sugar? If use bread flour instead, the texture would be different.